Double-sided Screen (chasm), 2014. Oil on wood panel, 96 x 60 x 16 inches. Front view. Crippled Wing, 2014. Oil on wood panel, 69 x 41 inches. Split the Lark, 2014. Oil on wood panel, 48 x 72 inches. Triptych (twilight), 2014. Oil on wood panel, 80 x 131 inches. My Blossoms, 2014. Oil on wood panel, 36 x 24 inches. Infinities, 2014. Oil on canvas mounted on wood panel, 50 60 inches. Pink Fissure, 2014. Oil on wood panel, 24 x 18 inches. Tondo (flush), 2014. Oil on wood panel, 48 inches diameter. DC Moore Gallery is pleased to present Split the Lark, an exhibition of new paintings and architectural forms by Darren Waterston. A catalogue with an essay by Jacques Khalip accompanies the exhibition. The work on view looks to the improbable images and the charged warning of an Emily Dickinson poem to explore the mystery of interiority and the boundaries we violate to satisfy our desire to know. The sculptural panels exhibited in Split the Lark deconstruct the forms of ecclesiastical objects such as confessional partitions and devotional objects, especially Matthias Grünewald’s 16th century Isenheim Altarpiece. Created for the monastic chapel of the Hospital of St. Anthony, this canonical work reveals both acute suffering and ecstatic salvation through its movable components. Waterston’s large-format Triptych (Twilight) is based on this polyptych structure. Its hinged side panels are flayed open, inviting close examination. Other freestanding or leaning panels assert their physicality while prompting viewers to probe recesses and shadows, looking beyond the surface. This immersive quality echoes Waterston’s site-responsive installations, particularly his subversive reimagining of James McNeill Whistler’s Harmony in Blue and Gold: The Peacock Room, currently on view at MASS MoCA. 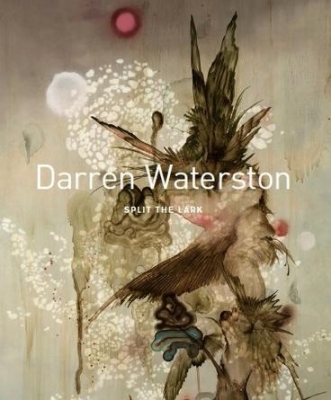 Darren Waterston graduated with a BFA from the Otis Art Institute in 1988, having previously studied at the Akademie der Künste and the Hochschule für Bildende Künste, both in Germany. His exhibition Uncertain Beauty, which includes the installation Filthy Lucre, is currently on view at MASS MoCA in North Adams, MA through February 23rd, and will travel to The Smithsonian Institution’s Freer/Sackler Galleries in May 2015. Darren Waterston: Filthy Lucre was recently published by Skira Rizzoli in association with MASS MoCA and the Freer/Sackler. Waterston lives and works in New York City. Artnet: "Darren Waterston in David Ebony's Top 10 New York Gallery Shows"